In 2007, Randy Pausch, a computer science professor at Carnegie Mellon Univeristy, gave a talk to his students. Prof Pausch was dying of pancreatic cancer and in fact, it would take his life in July, 2008. So, he stepped in front of his students and gave a talk called, "Really Achieving Your Childhood Dreams." It would be his "Last Lecture" but it didn't focus on dying as much as it focused on how to live. 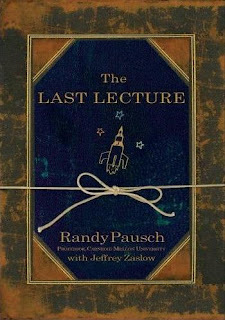 Prof Pausch's lecture was later turned into a book. It makes me wonder what would Jesus tell us in his "last lecture?" He, like Prof Pausch, knew that he was going to die also. He had that last moment with his apostles. So what did he say? Jesus' last lecture is better known to us as the Last Supper and what a night it was. If you recall, this is when Jesus instituted the Eucharist--"This is my body" and "this is my blood." He washed the feet of his disciples. He predicted his death and predicted Peter's denial. He reveals himself telling the disciples that he is the "way, the truth, and the life" and that no one goes to the Father except through him. He gets theologically deep telling them that the father and him are one. Finally, we get to the gospel reading for the this weekend--the sixth weekend of Easter--and Jesus finishes off his last lecture. He gives us some golden nuggets of revelation. They are bite sized statements but they are so theologically deep each one can keep you pondering for a bit. They are so simple but they seem to blow your mind away. He tells us that whoever loves him will keep his word and the father and him will dwell with them. But whoever does not keep his word does not love him. He tells us that the Father will send the Holy Spirit to teach us and to remind us of everything that Jesus taught us. He gives us his peace and tells us that the world cannot give us peace as he does. He tells us not to let our hearts be troubled or afraid. He tells us that he is returning to the Father and that if we loved him we would rejoice at his returning because the Father is so great. He then points out that he is predicting what is going to happen to him so that we might all believe. Now, how can I possibly blog on that!? There is so much compacted into this "last lecture" yet so simple that a person could write an essay on each tidbit. Maybe we just need to be reminded that here, here are some items to meditate on. Here are some quick things to always remember--to heed what God tells us, that the Holy Spirit is here to guide us, that Christ's peace is better than anything the world can give us, don't be troubled, and when our loved ones pass we should rejoice because they are going someplace greater than where we are. Maybe, if we are trying to get closer to God, we can take each one of those short, theologically deep subjects and meditate on one. There seems to be one for wherever we are in our lives. I wonder, if after hearing Jesus' last lecture, if the apostles say there as dumbfounded as I am?